The European football scene was dominated by an ingenious Barcelona penalty and a Paris St-Germain defender's ill-advised video this weekend. 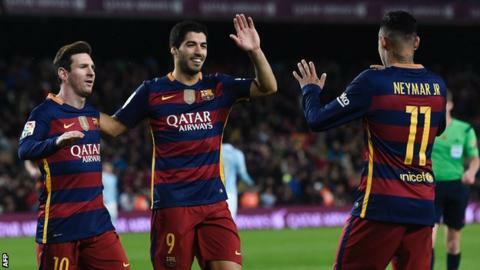 Lionel Messi's decision to pass his spot-kick sideways for Luis Suarez to complete a hat-trick provided an extraordinary talking point as the La Liga leaders beat Celta Vigo 6-1. Meanwhile, PSG right-back Serge Aurier was suspended indefinitely after appearing to use homophobic language to insult coach Laurent Blanc during a chat with fans on a social media site. Juventus went top of Serie A for the first time this season as their remarkable push for the title continued, while Bayern Munich reasserted their dominance in the Bundesliga. But what about the more off-beat tales from around Europe this weekend? BBC Sport rounds up the stories you may have missed. When Iker Casillas made his tearful exit from Real Madrid last summer, one could have been forgiven for wondering whether the Spain international would recover from his obvious heartbreak. The 34-year-old goalkeeper left the Bernabeu after 25 years, 725 appearances and 17 major trophies to join Porto. But, apart from the odd blip, Casillas is enjoying his new life in Portugal. On Friday he inspired a memorable 'O Classico' victory as Porto claimed their first victory at arch-rivals Benfica for four years. Casillas made a string of superb saves as the visitors won 2-1, leaving them three points behind second-placed Benfica. Meetings between Benfica and Porto hold such significance because they are the two most successful clubs in Portuguese history. The pair have won the past 13 league titles between them - but their duopoly looks to be under threat. Sporting Lisbon - the other member of Portugal's 'Big Three' - are currently three points clear of Benfica following a 4-0 win at Nacional on Saturday. The last time that Sporting were crowned champions? All the way back in 2002 - when Cristiano Ronaldo was still among their youth ranks and yet to make his senior debut. Julian Nagelsmann made history last Thursday when, at the age of 28, he became the youngest manager in Bundesliga history. He was scheduled to take charge of relegation-threatened Hoffenheim at the end of the season, moving up from his role as the club's under-19s coach, but his appointment was brought forward as Huub Stevens stepped down because of health problems. A centre-back in his youth, Nagelsmann's hopes of a playing career were ended in his late teens by knee problems. He went to university to study business administration, before beginning a career in youth coaching. Nicknamed 'Mini Mourinho' by former Hoffenheim keeper Tim Wiese, his reign started with an unspectacular 1-1 draw against relegation rivals Werder Bremen on Saturday. On-loan Leicester forward Andrej Kramaric put Hoffenheim ahead but was later sent off. Nagelsmann's side remain deep in trouble. "Even I'm not as unlucky as Holger Badstuber, and that really is saying something"
Remember Unlucky Alf from The Fast Show? Paul Whitehouse's mishap-prone northern English pensioner was never able to negotiate an episode of the 1990s BBC sketch show without coming to grief in some way or other. One week a passing truck would splash him with mud, the next he would fall into a hole. Well, if there is one person who suffers even more misfortune than Unlucky Alf, it is Holger Badstuber. The Bayern Munich and Germany defender, who has lost two years of his career to a knee injury, was ruled out for a further three months when he fractured his ankle in training on Saturday, with nobody anywhere near him. Badstuber, 26, tore his cruciate knee ligament in 2012, then suffered a repeat injury six months later, missing the 2014 World Cup - which Germany won without him. He returned to competitive action early last year, only to suffer a thigh muscle injury in April which kept him out for another six months. It was hard to argue with the Bayern Munich statement that referred to his latest injury as "unbelievable bad luck". As a show of support, Bayern's players wore T-shirts bearing the phrase: "Wir sind bei dir. Du schafft es wieder." That translates into English as: "We are with you. You can do it again." The Athens derby between AEK and Olympiakos is usually good for a bit of incident, and Saturday's top-of-the-table Greek Super League meeting was no exception. Olympiakos are certainties for the title, having dropped just two points in their first 21 league games this season. But match 22 saw their unbeaten run ended with a 1-0 defeat by their city rivals - with three red cards thrown in for good measure. As the tweet says: "1-0 the final score at the Olympic Stadium, with the goal by Ronald Vargas"
The runaway league leaders finished with nine men after Alberto Botia was dismissed early in the second half for a professional foul, and Luka Milivojevic was shown a second yellow card for a handball that gave AEK a 78th-minute penalty. Diego Buonanotte hit the post with the spot-kick, but Ronald Vargas converted the rebound to give victory to AEK, who were reduced to 10 players late on when Rodrigo Gallo was dismissed. Not that it is likely to make much difference in terms of the title destination: Olympiakos are still 16 points clear with 24 left to play for. Legend - or, more accurately, myth - has it that the 16th century explorer Sir Walter Raleigh once laid his cloak over a puddle to prevent Queen Elizabeth I from getting her feet wet. For such an act to have worked, Sir Walter would have required either a shallow puddle or a very absorbent coat. Fast forward roughly 430 years, though, and there is a tale of genuine selflessness to be found in modern-day Italy. Striker Stephan El Shaarawy was lining up on the pitch before Roma's Serie A match at Carpi on Friday night, when he noticed that the mascot in front of him was shivering in the cold. Without hesitation, the striker took off his tracksuit top and gave it to the young girl to keep warm. She was left with a souvenir to show off to her mates, while Roma went on to enjoy a 3-1 victory. Everyone was happy - well, apart from Carpi, who could probably do with El Shaarawy's tracksuit top to cover their eyes so that they don't see a league table. Fabrizio Castori's team are next to bottom, five points from a position of safety. "Here, have my tracksuit top. I'm going to be running around for the next hour-and-a-half anyway"
And with Valentine's Day falling on Sunday, what better way to finish than with a tale of Love? Vagner Love, that is. The Brazilian striker had not scored for Monaco since has move from Corinthians last month. He picked the perfect day to put that right. It was certainly good timing. His side were a goal down to St-Etienne with six minutes left when he struck to save a point in a 1-1 draw. The result leaves Monaco second in Ligue 1, a mere 24 points behind Paris St-Germain with 12 games to play. So, in summary: Love may conquer all, but probably can't win you the French league.